Being the parent to a boxer is a lot like being a parent to your own children. Offering him the best possible nutrition and dietary opportunities available should be one of your highest priorities in owning this stocky, mid-sized breed. Since the earliest recognition of the Boxer way back in 1895, one of the greatest things to note about the breed is their devotion and faithfulness to his master or household. Keeping this lovable and loyal breed at his best comes down to the bottom line of what you feed him to stay both happy and healthy! 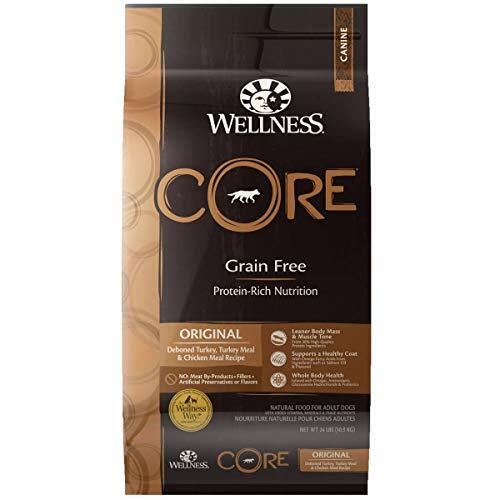 Best Naturally Raw Food: Having an incredible source of protein available to your Boxer is essential. . Something to surely appease his palate is the Freeze-Dried Canine Lamb Formula mastered by Primal Pet Foods. It’s important to note that this particular recipe is full of wholesome lamb raised without antibiotics or growth hormones. It is also free of wheat, soy, grain, and corn. It’s important to note these things as this blend is allergen-free to your Boxer – who may himself have developed food allergies. Boxers are natural flesh-eaters like most other dogs so the best food for boxers needs to be primarily protein-based. 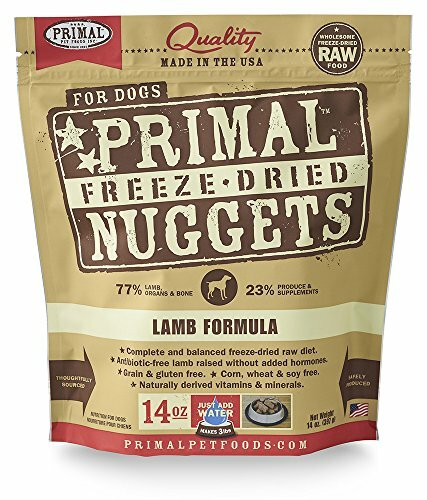 Giving them a source such as the lamb in this formula is a great way to boost their natural instincts as well as offering them all the proper nutrition to stay fit and healthy. 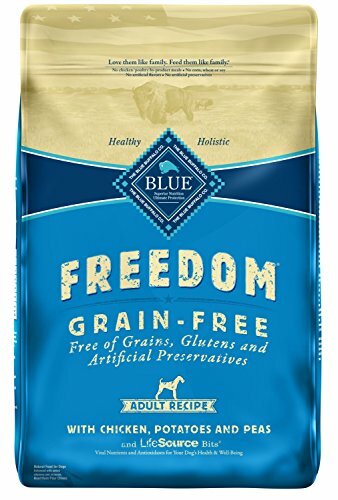 The Best Combo of Wet + Dry Food: Another well regarded and highly recommended product for your Boxer is Blue Buffalo’s Freedom Chicken Recipe. Blue Buffalo offer this blend with deboned chicken as the primary ingredient, with secondary carrots, sweet potatoes, and peas. Offering your Boxer this particular food is something great not only because of it’s incredible nutritional value, but because it doesn’t contain any poultry by-products or any artificial ingredients. Another added bonus is the consumer reviews raving about how much this product has helped put at ease any boxer health issues and digestive problems that could occur (more on this later). The Finest Available Food Without Grains: For the Boxer with more sensitivity to food allergies, Wellness brings you their Original Formula. This is a great option as a 100% grain-free food. Aside from being grain-free, this recipe is full of high protein content, and is completely free of preservatives, as well as by-products or artificial ingredients, arguably making this the best dog food for boxers. 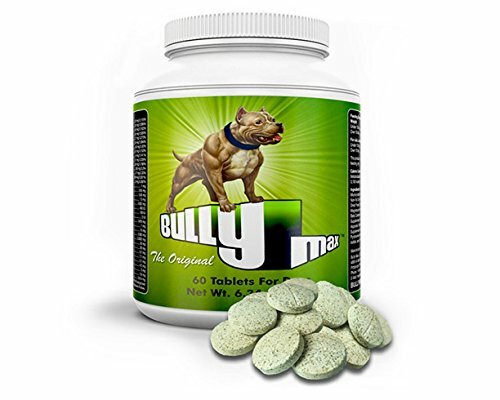 Speaking of a high protein content for optimal nutrition, there’s one other thing you could do to achieve this working dog’s optimum potential – here’s bringing you Bully Max! What Supplements Could Be Added to the Best Dog Food for Boxers? At his very core, the Boxer is a fairly active breed. Whether it be jumping household furniture, or pleasing your playful desires by playing fetch. Particularly, if your Boxer is a little on the weaker side, you could offer him Bully Max Inc.’s very own Ultimate Canine Supplement! The supplement will build muscle, increase overall strength, and give both power and speed to boost your Boxer’s potential. In recent years, science and research have found common ground between the health of dogs and what’s going into their stomachs. A lot of illnesses that humans suffer from fall under the same that a canine could suffer from. Your boxer having a tummy ache is no fun for him, just as it’s no fun for you! It’s of utmost importance to study the labels and ingredients of what is in your dog’s food. Having the ability to at least pronounce what is on there is a good starting point. Having a high content in protein is important to dogs – but especially the Boxer breed because of their active natural behaviors. Check for familiar meats as well as fruits or vegetables. What’s In a Good Food for My Boxer? Without a doubt, finding the right food to feed your Boxer could prove to be quite a challenge. With so many opportunities available from pet food manufacturers, it could easily be mistaken that you’re convinced what you’re feeding him is perfectly suitable. With knowing a few things I’m going to point out to you below, you could be making a “good” decision an “even better” decision! • Natural and Holistic Ingredients – If you find that the food you’re offering your Boxer has a primary ingredient of some sort of meat, and followed by vegetables, chances are you’re giving him something good! Natural and holistic ingredients are the finest things available to your Boxer. • Recall History – The U.S. Food and Drug Administration (FDA) is always maintaining a list of pet food recalls, similar to human food. It’s important to know if a pet food manufacturer has had a recall, as well as their response. Contamination could occur in a number of ways, some of which include cross-contamination or failures in the equipment used to manufacture their products. You could find a maintained list here. • Consumer Reviews – Knowing what others have to say about anything, whether it be your curious shopping expenditures or dog food, is a very important consideration. Remember that your Boxer’s health is on the line! Taking the time to research food for your Boxer will most certainly benefit not only you, but him and his health as well. It’s commonly practiced for Veterinary clinics to offer food products, but don’t be mistaken that these are the obvious best choices. They often have some sort of affiliation or relationship with food manufacturers, much how pharmaceutical companies share a bond with doctor’s offices to offer their products. Unmistakably, it could be quite a challenge to find just the perfect food for your Boxer. With enough patience, reviewing, and research, you’re certain to get it right! 1. Feeding Your Boxer Raw Foods – This particular food should almost always be put away in the fridge, and is usually sold as frozen and/or fresh. 2. 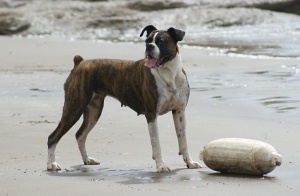 Natural Boxer Food that is Wet or Dry – One thing to primarily remember: wholesome ingredients! Most canine food will fall under this category. A primary meat, as well as veggies and fruits. 3. Feeding Your Boxer Whole-Cooked Foods – Another great option is to offer your Boxer whole-cooked foods that you would cook and prepare yourself. The best part of all? You know exactly what’s going in his tummy, and there’s no need to check lengthy labels or do consumer research. Some great resources for preparing your Boxer’s meal yourself can be found here. 4. Feeding Your Boxer Foods Not Containing Grains – Perhaps you’ve noticed that your Boxer has a peculiarly sensitive stomach, or is allergic to most common-brand dog foods. This would surely prompt you to offer him something that does not contain grains like rice, corn, or wheat. If you happen to find that your Boxer is excessively itching or observe other tell-tale signs of allergies, he should be taken to see a veterinarian right away. As stated in the beginning, parenting a four-legged friend as if your own child isn’t something to overlook, and the first step is finding the best dog food for boxers. Ensuring he has the proper nutrition and the very best diet you could offer him is essential to his health (and yours due to ease of mind). Overall, with the recommendations above, you’ve got a great foundation to know the various options available to you and your dog. For our food recommendations for other dog breeds, please check out our Table right here.